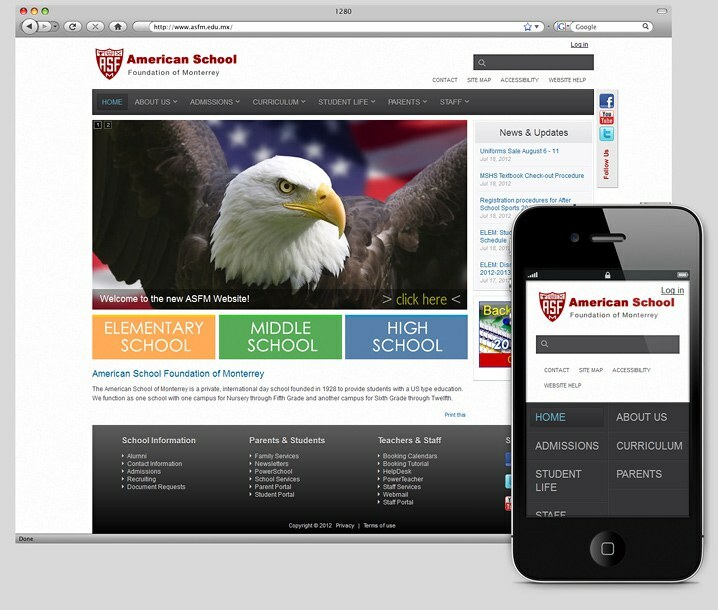 Case Study about The American School of Monterrey website development. The American School of Monterrey is a private, international day school founded in 1928 to provide students with a US type education. The American School Foundation of Monterrey is a private, non-profit, independent, international day school providing a U.S.-type education to international and Mexican students. While the school offers a curriculum similar to U.S. schools in many respects and is fully accredited in the U.S., it is incorporated and licensed in Mexico and students must also meet all requirements for the Mexican diploma unless they are of high school age and specifically registered only in the U.S. high school diploma program. Quintagroup designed and developed a few Plone themes for the client, the latest one features responsive web design. After considerable planning and collaboration with the clien, Quintagroup has developed the ASFM theme for Plone 4.1, fully responsive theme that adjusts its design, so the website will display beautifully and intuitively no matter what type of device it is browsed with. Since youngsters are always mobile, this way the students can keep up to date with their studies any time, any way, on any device. Finally, today’s world has long as entered the social media era where individual behavior is most influenced by a recommendation from a trusted friend, which creates the need for social sharing features in any kind of website. The ASFM theme has integrated social media to connect the visitors to relevant social networking sources - Facebook, Twitter, YouTube, Google+/. a script that performs a bulk upload of new accounts into Plone FacultyStaffDirectory product via CSV file. a script that does a bulk modification of the existing accounts in Plone FacultyStaffDirectory product via a CSV file upload. a script that does a bulk deletion of the existing accounts in Plone FacultyStaffDirectory product via a CSV file upload. a) Forms containing multi-select field (for different departments: Sales, Support, Administration, etc.) should have special script added that would send the form to the corresponding email address depending on what item is selected in the field. b) Forms have a boilerplate template that is sent to the receivers after form submission, however such boilerplate should take values from the form (name, date, location, etc.) and substitute them into the boilerplate before emailing. Quintagroup developed a Plone Theme for The American School Foundation of Monterrey, based on Plone 4.1.